Straw gold in color, this wine had a toasty, creamy aroma on the nose, with a teensy hint of ripe apple. It was served at about 40 degrees F (I asked about the temp of their fridge), so I let it warm up a little before I continued to taste, because I wasn’t smelling much more than the oak. Upon warming, the wine presented a slightly honeyed creaminess and some sharp pear aroma. When I tasted it, I noticed some oak tannins and a good dose of mineral on the mid-palate, which almost felt astringent. Maybe the astringency came from the oak tannins; I’ve never noticed mineral coming across as astringent before, but that’s how it seemed at the time. Fruit on the palate was a rather lemony-green apple, but super-integrated. If you must pair this with food, go with a pasta alfredo or something involving brie. In my mind, though, this is a Drink-It-On-Its-Own wine. If I had purchased it for $35, I would be disappointed. About the winery: HdV is a joint venture between two big players in the wine biz: the de Villaine family, famous for their super-duper premium Domaine de la Romanee-Conti (DRC) Burgundy, and the Hyde family, famous for their epinomous vineyards in the Napa side of Carneros, which have supplied grapes to some of the most recognized wineries in California (Kistler, Ramey, Paul Hobbs, Patz & Hall). 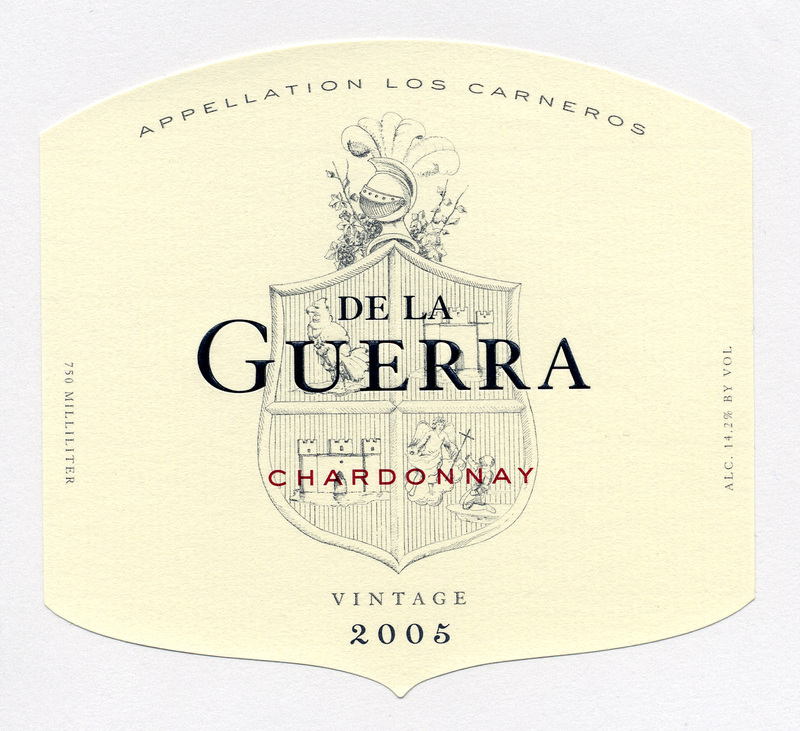 This Chardonnay is called De La Guerra in honor of an ancestor of the Hyde family, Don Jose de la Guerra y Noriega, who made wine in Santa Barbara in the early 1800s. A de la Guerra family wine evidently won a gold medal, back when Americans cared about non-Olympic gold medals, at the 1876 Philadelphia Centennial Fair, back when Americans cared about Centennial Fairs. I tasted this wine as part of a premium tasting at Lake Travis Wine Trader. They do a 3 wine flight of premium wines ($35 per bottle and up) every Saturday for $20, and they have other neat tasting programs, in addition to their excellent by-the-glass list. It’s up near my house, so I’ll be going back, you can be sure. Wine marketing frequently throws normal advertising rules out the window, when it comes to Americans. We love all things new, right? Bright, shiny and new: new iPhone, new house, new car, new Hollywood star, new bestseller… in a world in which technology seems to be accelerating life, we work harder and harder to keep current. So why does the term “Old Vines” have such cachet with us? It sells the crap out of wine, let me tell you. It’s one of those terms that, when a wine-nervous consumer sees it, makes her feel that she’s in good hands. Don’t worry, say the Old Vines, we’ve been around the block a few times and we’ll treat you right. And Old is supposedly a good thing when it comes to wine, right? Wine ages, and gets better with age (sometimes). “Old Vines,” though, refers to the age of the vines producing the grapes producing the juice producing the wines, though — not the wine itself. Apart from the comforting sense that at least something is old about the bottle you’re buying, what is it about old vines that makes a winery think they should put it on the label? In Europe, where they invented the term (Fr: vieilles vignes), wine producers slap the Old Vines on a bottle to brag about how long wine’s been made on their land. It makes sense, if you are a devotee of terrior , the concept that what makes a wine good is the land its grapes come from. Older vines have deeper, more complex root structures that, according to some terrior believers, bring unique, irreplaceable elements to the wine grapes. Especially in Europe, vieille vignes also implies that the people making the wine have been doing so for generations, and therefore really know what they’re doing. Ironically enough, though the Old Vine mystique was born in Europe, it is now many non-European vineyards that can boast some of the oldest vines in the world, Chile, Australia and California in particular. We can blame this on the phylloxera blight of the late 1800s, which all but annihilated the wine industry in Europe until it was discovered that native US rootstock was immune to the disease. European varietals were grafted onto new rootstock, which saved the day, but it means that many of the greatest, most expensive wines in Europe come from vines that were planted less than 100 years ago. There is one other reason to prize the old vine, and that is yield. As vines age, they naturally produce fewer grapes, but those grapes are said to be more intense and packed with flavor and complexity. It’s as if all the energy of the grapevine is concentrated into fewer grapes, but better grapes. The problem with the term “old vines” is that it’s completely unregulated, even in France, where they love them some wine regulations. So while any of the reasons to choose a wine made from really old vines are good, it’s hard to tell who to trust. Is Winery X’s definition of old 20 years? 30 years? Or are we talking 100 or 130 years old here? Sussing this out is mostly a matter of knowing your regions and varietals, unfortunately. I’m not shocked to hear of 100-year-old Zinfandel vines in California, but I’d be surprised to hear of 100-year-old Sauvignon Blanc vines there. I’ll believe almost any vine is super-old in Australia, because way back in the mid-1800s James Busby, a very serious Australian wine evangelist, collected all the varietals he could from Europe, and spread the gospel of grapes. I know that in Spain’s craggy hills and valleys lie vineyards that time and the modern world had forgotten until very recently, and so a $10 bottle made from 80 year-old-vines is feasible. In the end, though, the term Old Vines on a bottle means less to me than the region, the winery, the price, and the grape. It’s always nice to drink the juice of historical grapes, but only if the wine is well-made, and is appropriate to the food and/or the setting. I got the heads-up on this wine from The Cork and Demon, a great Austin wine blog. Taj paired it with meat manicotti and friends; I had it with pizza and Borat with friends. Overall, a medium-bodied, simply tasty wine that is everything I want out of a casual table wine, including the price. Juicy-juicy goodness. When I was a kid, I wanted desperately to be sophisticated, and dreamed one day of knowing all about wines and vintages. (I also wanted to be able to spout whole monologues of Shakespeare, earn my PhD before my 25th birthday, and live in a tower.) I didn’t grow up in a alcohol-friendly household; there was no alcohol in our house at all, except for a bottle of Blue Nun that would show up in the fridge every 6 months or so, titillating us kids with its very existence. MOM! we would shout, THERE’S WINE IN THE FRIDGE! She would yell back, DON’T WORRY! IT WON’T BE THERE FOR LONG! My first taste of beer was out of a half-warm can of something domestic, and nearly put me off it for good. After an abstemious 80s adolescence with only a few B&J wine coolers under my belt, I finally had my first real glass of wine, my epiphany wine. I had a room-mate when I was about 19 who was a great cook, an older woman, and she let me have a small glass of a special bottle she had in the house. It blew my socks off! THIS was what it was supposed to taste like! THIS is what all the fuss was about! Whatever your name was, Ex-Roommate of Long Ago, I thank you. I only wish I could remember what the wine was. In later years, tasting big Cabs and first growth Bordeaux, I think it may have been either a really mellow Caymus Cab, or possibly a down-market Margaux. Nameless Ex-Roommate also introduced me to the concept of sweeter spices like cinnamon and clove in savory dishes with some divine African-inflected stew she once made. If only I hadn’t moved out — I could have been a freaky foodie so much sooner! I don’t drink wine every day (have to maintain my amateur status), but I know what I like and I know what I like to pair with what dishes. I am a Certified Wine Specialist with the Society of Wine Educators, and I sold wine and taught classes about it for about 5 years. Now I have a Joe Job that pays the bills (most of them), but I still have my same love for wine. What made my love for wine a lifelong passion and not just a passing fling is that wine, for me, provides a sensual and an intellectual pleasure all in one. You can never stop learning about wine… even if you’ve learned everything about every grape and every region and every winemaker and every vintage, there’s a new harvest happening somewhere in the world RIGHT NOW. Therefore wine offers infinite opportunities to learn new things and taste new things. And isn’t that the best part of life? Robert Parker called the 05 Pillar Box Red one of the best wine values in the world. Let’s see what the white’s like! Clear straw yellow with green reflections. Floral, nectarine, lemony, slightly honeyed nose with nice granny smith apple tartness. Good viscosity and a minerally finish. Very tart and slightly chalky on the palate. Extended lees contact and some neutral oak, evidently, which would tend to explain the complexity on the palate despite the one-noted appleyness I get. This is a super wine for food because of its round, rich mouthfeel and the bright acidity and minerality at the end. It’s not easy to find a new world wine with such nice acidity and rich, heavy texture. I’d pair this with a blackened chicken or carnitas. Complete aside, in which I ramble on about a little-known grape varietal: Verdelho is a grape that’s best known for being one of the four main grapes used to make Madiera. Madiera is a kooky little island that’s closer to Morocco but is evidently owned by Portugal. According to The New Sotheby’s Wine Encyclopedia, the island was discovered by Captain Jao Goncalves (known as The Squinter), who sailed off to find Guinea and couldn’t figure out why this one cloud never moved. In 1418, he decided to sail into the cloud and, lo and behold, he hit land. The forest was so dense that the Captain decided that the best thing to do was burn it all down; legend says the fire he started burned for 7 years, and it’s said that the resulting effect on the soil is the reason that the wines grown on Madiera are so fantastic. One of these days I will post tasting notes on a Madiera, and we’ll get into the reason that the wine’s baked! Anyhow, Verdelho was brought to Australia in 1825, and it’s really only in Australia that it has a healthy sense of self. In Portugal, they make a kind of flabby, white trash Verdelho in the Duoro Valley. Madiera’s Verdelho is blended and then, as I have mentioned, baked, so it’s kind of like an over-tanned, aged conjoined quadruplet. In Australia, Verdelho is allowed to shine on its own. Depending on the region it’s grown in, it ranges toward tropical, floral characteristics or grassy/lemony/herbaceous notes, and can make a high-alcohol wine if the grapes are picked late. Oak aging will stabilize it, add creaminess, and sometimes bring out a nutty character. In this Pillar Box White, I would attribute the floral and nectarine odors to the Verdelho. Also perhaps the lemon. The flavor and texture seem mostly Chardonnay to me, and the acidity is certianly encouraged by the Sauvignon Blanc, but a lot of the nose seems to be that Australian Verdelho talking. So here’s what I don’t get: when did wine get so snooty? Humans have been drinking the stuff since ever since any of us can remember. If familiarity breeds contempt, then we should be snotty to wine people, not the other way around. They make it all over the world now, just like cars. And we Americans love our cars, but we don’t tell people to pick a car for us because we don’t know enough about them. Sure there are an overwhelming number of choices of different wines out there, but you could say the same about sodas, and I don’t see anyone taking classes to learn what kind of Coke they like. What’s the big deal? It’s grape juice that had a brief affair with yeast and was never the same since. Gracious, how would any normal human being learn all about wine if she weren’t completely obsessed with it, or in the business itself? I say, you don’t need to know everything about wine to know what you like to drink. And, I say, that is the purpose, the raison d’etre of wine itself: to please you. The wine that does not please you has failed, poor darling. I dream of a world where we’ve learned to pair the right wine with the right person, and everyone drinks what they love without the haunting feeling that they’re showing ignorance by simply enjoying what’s in their glass. In this blog, I plan to write about wine I’m tasting, wine events I attend, and wine-related subjects I enjoy. As I do so, I hope to encourage you, gentle reader, to find the wines you love, drink them, and enjoy doing so. Who’s with me?